The BBC website has a great slideshow of photographs by Eamonn McCabe of writers' rooms --- from Martin Amis to David Lodge to Roald Dahl. I particularly love the skylights that Seamus Heaney and Martin Amis have. 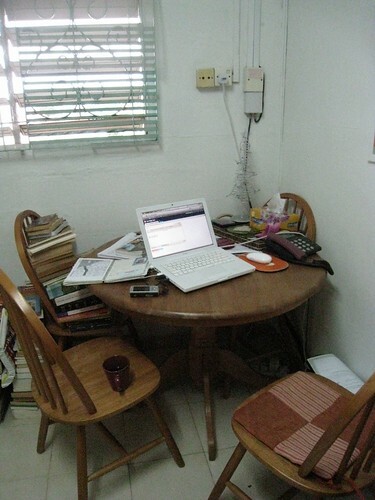 My own writing space at home is much more mundane. Cheap, too. A whole room, for starters. A chair/table setup that's better for the back --- wish I could afford the new Herman Miller Embody. More natural light --- I totally fell for an apartment I can't afford in Joo Chiat two weeks ago because it had glorious windows. Totally understand re: windows and natural light. I saw 8 apts in Antwerp, and took the one with the most windows & daylight. It helped that I loved the apartment best too, but the windows sealed the deal. Yes, good natural lighting is essential. That's why, I took the office with floor to ceiling windows facing the afternoon sun. It is slightly chilly just now as winter is here but well worth it. Looking out on the several centimetres of snow in my Herman Miller Aeron chair is similar heaven.